Yesterday a group of us knitters1 got together to knit2, chat3, show off4 our completed projects and drink tea. It was a happy occasion for all eight of us excepting that my cold and cough were bothering me. Everyone else seemed to have the same cold too so I didn’t feel too guilty at being there. I wore the new wool sweater I had recently finished knitting for this winter season. It was warm and toasty5. Another friend was finishing a big white afghan6 that she was making for her daughter. Yet another knitter was making a purse7 for her teenaged granddaughter. She has five granddaughters and made a purse for each one. Each is lovely and different from the others, just like her granddaughters, she says. The hostess was making a sweater to take to a church in Des Moines, where the pastor8 distributes9 warm clothing to needy children10. 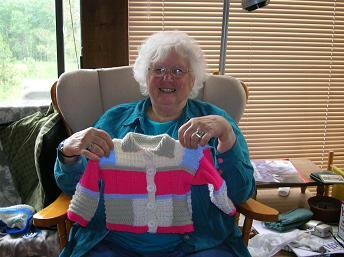 She believes that the sweaters she contributes should be bright and cheerful. I agree and told her I’ll get one finished for her to take when she takes hers next week. I am also finishing an afghan to send to Kathy Li, our honorary Chinese granddaughter. I’ve made it out of leftover yarn scraps11 from other projects, so it will be a bright and cheerful cover for her and her mom. As I sew the strips together, I fondly remember the projects I used the various colors of yarn for and hope the recipients12 have enjoyed them. As we sat, talked and drank tea, we also discussed the joy of sharing our creativity13 with others. One young lady who was there is married to a farmer who raises sheep. She both spins14 and dyes15 the yarn she knits with. Her projects are special, of course. Our hostess yesterday grew up in the country of Lebanon16. She makes special Lebanese honey pastries17 and cakes which she shared with us all. It was a warm and festive18 occasion for all of us, including their little dog who begged for cookie bites. As we all left, we felt we had truly started the Christmas season in the right way. 3. chat: talk informally with others (闲聊). 4. show off: (Informal) exhibit something with pride (显示，炫耀). 7. purse: a small bag in which money and other small items are carried by women (女式钱包). 8. pastor: the leader of a church (牧师). .
9. distributes: gives out items to others (把……分给). 11. scraps: small amounts or pieces of left over material (剩余的零碎东西). 12. recipients: people who receive something (得到东西的人). 16. Lebanon: a Middle Eastern country close to the Mediterranean Sea (黎巴嫩，靠近地中海). 17. pastries: small baked items made from some sort of dough, usually sweetened as desired, and in various shapes and forms (小点心). 18. festive: party-like, happy or joyous in nature (节日般的，喜庆的). My name is Kimberley Huffman. I am the only daughter of Don and Maxine Huffman. I have studied many things, including cooking. My current job is as Kitchen Manager1 at our local public intermediate school2. The school is US grades 4, 5 and 6. The students range in age from 9 to 12. My job is to oversee3 the production of school lunch for over 1000 students in our town. The National School Lunch program4 began in 1946, though students at many schools were already being served lunch by then. School Lunch is a federal program and much of the food and financial assistance comes from the government. The government makes guidelines5 and standards6 for schools who serve lunch to their students. Many of these guidelines regard portion size7 and items that are served. The standards include the principle that students should be given healthy choices8 along with well balanced meals9. Schools must serve protein10, starch11 and fruits / vegetables and offer milk to students. Students must pay for lunch each day, but if they are unable to, there is a national program that enables students to have lunch for free or a reduced price, depending upon their household income12. There are enough options14 served that even if students don’t eat everything, they are given the opportunity15 to eat a well-balanced meal. Bread, cake and desserts are baked at our school; however, most schools choose to buy these items for students. Students at my school eat in a cafeteria16, separate from all of the classrooms. It is considered very unsanitary17 to eat in the classroom and most schools have a separate cafeteria. Many schools have a gymnasium18 that converts19 into a cafeteria for lunch and back to a gymnasium during physical education or assemblies20. In our school the cafeteria remains separate, thus more sanitary21. We do our best to keep it that way. 1. kitchen manager: the official title of Kim’s position, in which she supervises about 8 cooks who prepare the lunch for about 800 to 1,000 or more elementary school students in Pella, Iowa City Schools （厨房管理员). 2. intermediate school: a school which consists of class grades 4, 5 and 6 (含有四、五、六年级的学校). The name of the school is Jefferson Intermediate School. 3. oversee: be in charge of a group of workers and check that a piece of work is done satisfactorily (监督，管理). 4. The National School Lunch Program: a federally funded program which provides some items of food as part of lunches that are served in public schools in the U.S. (国家的学校午餐计划，为美国公立学校提供的由联邦政府资助部分午餐). 5. guidelines: suggestions or rules which indicate how the school lunch program should be carried out (指导原则). 6. standards: the specific criteria for cleanliness, portion size, cost, caloric content, etc. (专门的标准，如卫生要求，每份午餐的量，成本，热量要求等). 7. portion size: the amount of a food item that is served to an individual student (每份午餐的量). 9. well balanced meals: lunches which meet all nutritional requirements as set by the U. 12. household income: the amount of money which a single household or family earns (家庭收入). Level of household income is used to determine pricing of lunches, and permits reduced prices to low level income families. 13. hamburger on a bun: a sandwich consisting of a beef patty between two halves of a bread bun, with choice of seasonings and vegetables, i.e. mustard, ketchup, lettuce, tomatoes, onions, etc. (一种汉堡，把圆面包切成两半，当中夹上牛肉饼，并加上调料和蔬菜，如芥末，番茄酱，生菜，番茄，洋葱等). 15. options: choices of foods within a food type (一类食物中可供任选其一的几种食品). 17. cafeteria: the food serving and eating area of a school (学校的自助食堂). 18. unsanitary: not clean, contaminated with potentially harmful bacteria, viruses, etc. (不卫生). 20. converts: changes from one thing to another (改变). 21. assemblies: times when the entire school meets together (全校集会). 22. sanitary: clean, or free from harmful germs (干净，卫生). I asked my friend, Joline De Jong to write this because I like the way she incorporates her love of art in all aspects of her life. My name is Joline (De Boer) De Jong. I was born in 1933 in the heart of the Great Depression1. My parents, Central College graduates whose grandparents immigrated2 here from the Netherlands, were high school teachers of history, English and Latin. As a child I had no idea that I would become an artist. Indeed I knew no artists personally except for my elementary school art teacher. When we moved to a smaller community3, there were no art teachers for grades six through twelve. My thrifty4 mother designed and sewed attractive dresses for my sister and me. As I grew older I enjoyed becoming the family’s seamstress5. This experience in designing and crafting6 garments7 was the closest I came to an art experience until my graduating class needed an illustrator8 for its yearbook9. I took up the challenge10. At Central College I intended to major in biology, but I took a beginning11 art class out of curiosity12. When I discovered that drawing pictures of my dissections of frogs13 was what I enjoyed most about biology, I switched14 to an art major. An admiration for the work of Frank Lloyd Wright24 led us to design our own house in 1970, which was built on a wooded hillside near the Des Moines River outside Pella. Wright was interested in creating houses which fit into their setting and which encouraged an openness within the house as well as an interchange25 between the interior of the house and its exterior surroundings in nature. Therefore we designed an open floor plan for its public rooms, which meant eliminating interior walls except around bedrooms and bathrooms. Wide sliding glass doors open the house to a deck which overlooks26 the woods. Large plants inside the house contribute to the harmony27 with the outdoors. 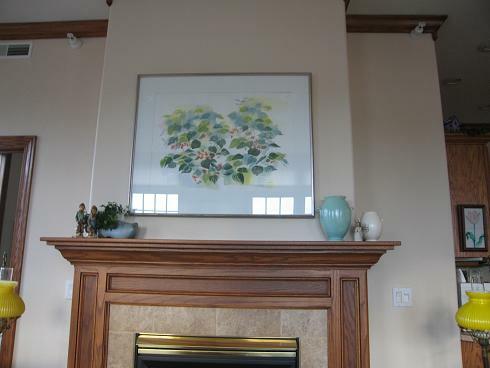 The interior of the house has been kept neutral28 in color with white walls, to focus attention on the artwork29 on the walls. I also like to make aesthetic choices for such things as the food I prepare for guests. Besides being nutritious and flavorful30, it is important to me that the food is attractive in color and texture31. The same principles of design which I taught my students continue to guide the choices I make in life. A creative problem may be solved by the manipulation32 of one or more elements of art such as line, color, form, texture and contrast33. A non-painting example of some of these: The addition of a scarf with a striking34 black and white pattern which a friend brought me from China added variety , contrast, and emphasis to an all black shirt and slacks ensemble35. Music has played an important role in our lives since my husband and I became acquainted while on a choir tour36 as college undergraduates. We have continued to sing in choral groups through the years. While music is a different art form from visual art they share many parallels37 in construction38 and presentation39. The ancient Greeks used a principle called “The Golden Mean40,” which gave balance and order to their aesthetic choices. Perhaps all cultures have something similar to which their people pattern their lives. Do you have some such organizing principle41 which you use? 1. The Great Depression: a period in U.S. History (about 1928-38) when the economy was not strong, and many people were unemployed (美国经济大萧条，约于1928至1938年期间美国经济不景气，很多人失业). 2. immigrated here from the Netherlands: moved to the U.S. from the Netherlands (从荷兰移民到美国). 4. thrifty: using money carefully and wisely (节俭的). 5. seamstress: a person who sews clothing (裁缝). 6. crafting: making something using a special skill, especially with your hands (制作). 7. garments: items of clothing (服装). 8. illustrator: one who prepares drawings or paintings for some sort of book (插图画家). 9. yearbook: a book dealing with a specific academic class and its activities (年鉴). 10. challenge: an activity which requires close attention and application of sound judgment (艰巨任务). 11. beginning: being the start or first part of something (起始的，入门的). 13. dissections of frogs: processes involved in cutting frogs so that the internal organs of the body can be studied and easily seen (解剖). 14. switched: changed from one thing to another (转换，更换). 16. studio courses: art topics that are taught in an art studio rather than outside. 19. responsibility: what is expected of one as a job or duty (职责). 20. media: particular materials that artists use for creating their work (艺术家创作时所用的材料). 22. esthetic: of a pleasing effect or appreciation of beauty or art (美学的，审美的). 23. spills over into other aspects of my life: spreads into other parts of my life (扩展到我生活的其他方面). 24. Frank Lloyd Wright: the name of an outstanding 20th century architect in the U.S. (法兰克洛伊莱特，20世纪美国著名的建筑师). 25. interchange: put each of two things in the place of the other (交互，互换). 26. overlooks: has a view of something, usually from above (俯视). 27. harmony: the pleasant effect made by different things that form an attractive whole (和谐). 28. neutral: not brightly colored, or not standing out as unusual in color (色彩不鲜艳的). 29. artwork: some type of artistic product (艺术品). 30. nutritious and flavorful: containing nourishing or healthful food items and having a strong pleasant taste (有营养的和味道好的). 31. texture: the way that a particular type of food feels in your mouth (口感，质感). 34. striking: attractive in an unusual way that is easy to notice (引人注目的，吸引人的). 35. ensemble: a set of clothes that are worn together (一整套服装). 36. choir tour: a trip taken by a group of singers (合唱团的巡回演出). 37. parallels: ways in which separate things or people are similar to each other (相似的手法，共同点). 38. construction: building, producing or making some physical item by putting them together (构筑方式). 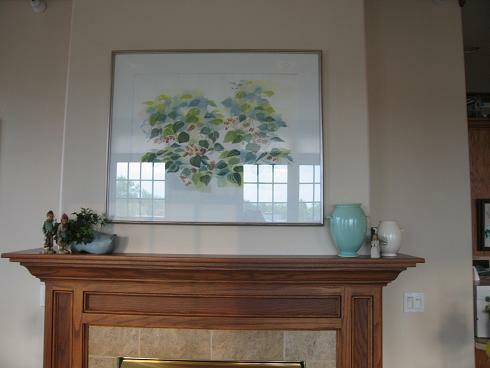 39. presentation: the placing of something, such as a work of art, so that it has the most appealing appearance (展示方式). 40. The Golden Mean: a principle of the Greek culture which sought for moderation or the most balance or middle-point between extremes (中庸之道). 41. organizing principle: a system which allows one to place things or ideas or perspectives in order in one’s life (使井然有序的原则). The following blog was written by a good friend of Kim’s, Tony Braida, an international businessman, Regional Manager for an international business firm. He regularly travels to Latin America, Canada, and the Caribbean. In my position, I use different languages. I speak six languages. Of course, English is my first language, the language I grew up speaking here in Iowa. My second language is Italian, which I learned from my elder relatives (aunts, uncles, and grandparents), who immigrated to the U.S. from Italy and spoke both Italian and Piemontese, a dialect1 from the Piedmont2 area of Italy. So I learned these languages at home and at family gatherings. I also speak Spanish, Portuguese, and some French. I studied Spanish in high school, did well with it, and continued studying it during my years at Central College. In the early 1990’s I did graduate work in Rome, which was an ideal opportunity to expand3 my Italian vocabulary and grammar. I also quickly learned that our “regional” version of Italian4 had changed considerably since my family came to the United States. Much of the sentence structure, word use etc. that I was accustomed to5 was now considered overly formal and almost archaic6. I would be like the difference in English from a black and white movie of the 1920’s and released this year….very different! Finally I took a public education course7 in French, then basically taught myself, via8 travel to the French Caribbean and France, as well as reading and watching French language television. It is interesting to note that the Italian dialect, Piemontese9, is composed of nearly one-third French words. This made it easier to learn and converse10 in French. Using other languages is important to me. During an average day in the office here in Iowa, I speak and write about 60% in Spanish, 30% in English, and, depending on the circumstances11, 10% in Italian or Portuguese. When I travel in Latin America12, nearly 100% of my conversation is in Spanish or Portuguese. I travel about 150 days a year, usually in five-day periods. I am fortunate in that I am able to fly first class on my trips since I have nearly five million kilometers on American Airlines, giving me elite status13. This makes long trips, like to Chile or Brazil, easier on my body. I also have the privilege14 of using special lounges15 provided by American Airlines and found at all major airports. I first entered the international marketing field over 20 years ago and started traveling extensively. Now cultural differences are second nature to me. This may sound strange, but the Internet and globalization16 have indeed changed the way at least my business is done. It seems like more and more of my clients follow a 9-5 work schedule17 and communicate, order, and run their own businesses much like we run a business here in the U.S. or in Europe. Mexico is where my normal 9-5 schedule gets thrown out the window18. It is not uncommon to start the day with a breakfast meeting at 10:00, finish at noon, go to other meetings until lunch around 16:00, then back to work, with dinner sometimes nearing 22:00 or later. It makes for19 a very exhausting20 day! I have been with my current company for over fifteen years now, where most of our customers (distributors21) are the same people I met on my first visit to them 15 years ago. It is not uncommon that they invite me to their home for dinner while I am in their country. Moreover, over the years I have helped many of them celebrate weddings, the birth of children, grandchildren, as well as mourned the death of their parents (sometimes even founders of the company and personal friends). Even though I know them well, I rarely take gifts to clients, due to ethical reasons22. However, there are distributors who will ask me to pick up some thing for them in the U.S. and deliver it to them. These are usually items that are difficult to find in their country (DVD’s, Disney items for their children etc.) I seldom bring things home, though I still make an effort to bring home Japanese peanuts from Mexico because Kim loves these. Finally, I impress some people with how fast I can pack for a week-long trip….ten minutes maximum. I have become a creature of habit. I usually take the same amount of clothes and items, depending on the season and where I’m traveling. I live by the mantra23 of “less is more.” In my opinion there is no reason for me to carry around one-half of my wardrobe24 while I’m traveling. My important rule for any person involved in international business relations is The Golden Rule, “Do unto others as you would have them do unto you.25” In fact, I try to live by this rule every day of my life. 1. dialect: a form of a language which is spoken only in one area, with words or grammar that are slightly different from other forms of the same language (方言). 2. Piedmont area: a mountainous area of northern Italy (Piedmont山区，位于意大利北部). 3. expand: make greater, enlarge (扩大，扩充). 5. accustomed to: familiar with, acquainted with (习惯于). 6. archaic: out of date, old fashioned (过时的，成就的). 7. public education course: a class offered to the general public in a city (为公众开设的课程). 8. via: by way of, through a certain way, by means of (通过，借助于). 9. Piemontese: a language dialect of the Piedmont area of Italy (意大利Piedmont 地区的方言). 10. converse: speak or discuss, have a conversation with (说，交谈). 11. circumstances: the conditions that affect a situation, action, event etc. (情况). 12. Latin America: the Spanish-Portuguese speaking part of the Americas, mostly Central and South America (拉丁美洲，美洲说西班牙和葡萄牙语的部分，大部分在中美洲和南美洲). 13. elite status: highest possible level for access to special favors from the airlines (贵宾身份，指可以乘坐商务舱或头等舱的乘客). 14. privilege: a special advantage that is given only to one person or group of people (特权). 15. special lounges: well provided places to rest and wait for boarding an airplane for a trip (贵宾候机室). 16. globalization: a situation in which something is considered on a worldwide basis (全球化). 18. “thrown out the window”: discarded (丢弃). In this case, it means all other schedules must be discarded to meet the Mexican schedule. 19. makes for: cause a particular result or situation (结果造成). 20. exhausting: very tiring, feeling of being worn out (非常疲劳的，筋疲力尽的). 21. distributors: a company or person that supplies shops and companies with goods (批发公司，批发商). 23. mantra: something repeated again and again (不断重复的东西). 24. my wardrobe: the clothes that I have (我的全部服装). Our friend, Todd Onken, is a retired smokejumper1 for the U.S. Forest Service2. He and his wife have been living and traveling for three years in China where she teaches in a private school in Beijing, and he studies Chinese language and culture. It’s only mid-July and already the western United States is once again suffering3 through another hot, dry forest fire season4. On this evening in McCall, Idaho I watch specially-equipped helicopters5 and airplanes returning from their day-long firefighting support duties fly low overhead as they land at the town’s small airport.6 The forest firefighters on the ground actually doing the sweaty, dirty work7 of putting out the flames now have the long night ahead of them to work on the fires without help from the aircraft. I know what it’s like to be out there in a wild part8 of the forested mountains working all night putting out fire because until just last summer, I was a smokejumper for 23 years. Newspaper reports tell us that presently about 15,000 wild-land firefighters9 are working to put out forest fires burning in the western United States and Alaska. All have been trained to do their jobs safely and efficiently, and most think they are well-paid to do the hard and sometimes dangerous work. Most firefighters travel to their forest fire work assignments10 each day by truck, helicopter or simply by walking. A smokejumper is a special (some say “elite11”) type of forest firefighter, who parachutes12 from airplanes to work on fires in remote13, often mountainous areas. Because of the expensive parachute training and equipment required to deliver smokejumpers safely to a fire’s edge, only about 450 men and women of each summer’s firefighting workers are hired as smokejumpers. The thrill14 of beginning a work shift15 by guiding16 my parachute to a safe landing near a forest fire after jumping from an airplane flying 160 km/hour is what initially17 attracted18 me to work as a smokejumper. Often I was able to land my parachute in a beautiful mountain meadow just a short walk from a fire’s edge. Sometimes gusty19 ground winds20 would drift my parachute to a landing in tall trees21, where I had to first rappel22 down a rope to the ground to go fight the fire, then return later to climb the trees and retrieve23 my torn24 parachute for repair and use for another jump. The worst parachute landings were the ones in which the winds, or poor parachute steering25 on my part, caused me to land among rocks and logs scattered on the ground. I was never badly hurt by such landings but did sprain26 my ankle once or twice. Now that I’m no longer working as a smokejumper, what do I miss most about the job that I made my career? I miss working with my friends, men and women who are strong and physically fit27, and not afraid of hard work or a parachute jump into the mountains. I miss the airplane rides and parachute jumps into some of the most beautiful mountains and forests on Earth. But to tell you the truth, I don’t miss as much those long, smoky night shifts28 putting out fire. 1. smokejumper；a person who parachutes from an airplane into an area where there is a fire to be put out (空降森林灭火员). 2. U.S. Forest Service: an agency of the U.S. government that oversees and protects the forested areas of the country (美国森林监护局). 3. suffering: being subjected to (something uncomfortable or unpleasant) (遭受). 4. fire season: the part of the year when the weather conditions cause fire to be more likely (火灾高发季节). 7. sweaty, dirty work: work requiring hard labor in often heated areas or conditions (又脏又累汗流浃背的工作). 8. wild part: an uninhabited area of a forest, or other natural area (荒野). 11. elite: the most skilled type of forest fire fighter (佼佼者). 13. remote: far removed from civilization or from inhabited areas (遥远的). 14. thrill: the excitement involved in doing a difficult and rewarding task (兴奋、激动). 15. work shift: the period of time during which one works at a job or assignment (工作时间). 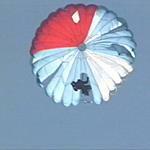 16. guiding: directing the descent and direction of a parachute (操纵、驾驭). 20. ground winds: the movement of air at the surface of the ground (吹过地面的风). 27. fit: physically able to very demanding tasks or activities (身强力壮). 28. night shifts: work periods scheduled for night time (夜班). 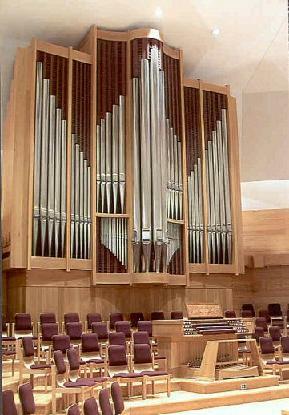 A pipe organ is a keyboard instrument.1 The musical sounds are produced when pressurized air2 blows through pipes3. The pipes range in size from 16′ (4.9 meters) or even sometimes 32′ (9.75 meters) for the lowest pitches4 to pipes smaller in diameter than a ball-point pen and only a few inches (approximately one-half decimeter) long. There are many different shapes and materials used in organ pipes to produce various tone colors5. The very smallest pipe organs have only one keyboard. Pipe organs with two or three keyboards are very common. These instruments also have pedals6, which are 6 or 7 wooden keys7, each 30 or 32 inch-long, to be played by the player’s feet. Each pipe can sound only one pitch. An organ keyboard typically has 61 notes8 requiring 61 pipes, one for each note. However, because pipe organs need to produce more than one color of sound, there need to be numerous rows of pipes (61 in each) resulting in instruments that have hundreds and often thousands of pipes. Pipe organs are found in a very large number of American and European churches and in some large concert halls9. Sometimes the larger pipes are used at the front of the instrument to produce a beautiful design10. There are many different designs that can be made from the pipes in this way. Sometimes all of the pipes are hidden behind a screen11. In China there are also some wonderful pipe organs including the Forbidden City Concert Hall, the Beijing Concert Hall, and China National Radio Station. 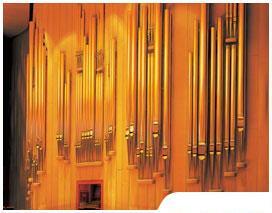 A very large pipe organ has recently been installed in the Oriental Arts Centre in Shanghai. It has five keyboards plus the pedal keyboard and more than 6,000 pipes. You can see it in the photo to the right. For me it all began12 when I was a very little child only four or five years old. One of the most important church festivals is Christmas. In the village where I grew up the young children all learned Christmas songs and little Christmas poems to perform in a special Christmas program. All the children would form a procession13 to come from the back of the church to the front. Everyone in the whole church would be singing, accompanied by the pipe organ14. As we walked up to the front of the church we passed close to the pipe organ. When I was closest to the organ I could feel the vibrations15 of the lowest notes through the floor. I was very excited by this sensation16 and decided I wanted to learn to play the organ because it had such a big and wonderful sound. To learn to play the pipe organ it is first necessary to learn to play the piano well. If anyone tries to learn to play the organ without first developing17 strong keyboard skills18, that person will become discouraged19 because it will be too difficult. For that reason I began to take piano lessons when I was just six years old. I had a lesson each week and was expected to practice my lesson for 30 minutes each day. My parents, especially my mother, did not let me skip20 days or practice less than the required 30 minutes. Most days I was very happy when I was practicing, but some days I would much rather21 be outside playing ball22. I learned piano technique23 quickly and learned many, many songs by the time I was twelve years old. To my great joy24 I was allowed to take organ lessons during the summer. The church was one mile (1.6 kilometers) from our home on a farm at the edge of our town. Each day I would ride my bicycle to our church to practice the organ for one hour. Then I would ride back home to do the work my dad had for me to do on the farm. Each summer from then until I graduated25 from high school six years later I looked forward to my organ lessons. The photo to the right shows the organ I first learned to play. During the school year I would take piano lessons because I could practice the piano at home when there was not time enough for me to go to practice on the organ at church. When I went to Central College26 I chose music as my major course of study, and took organ lessons all four years. Then I went to graduate school27 and had two more years of organ lessons in New York City. By that time I was married and starting a family28, so I needed to work and earn money. I had a job as director of music29 in a large New Jersey30 church for a short time, and then there was an opening to teach organ and other music courses at Jamestown College31 in the state of North Dakota32. I enjoyed that until I was invited back to Central College to teach. That was in the year 1967. I taught music at Central College until I retired33 in 2000. Now I am almost 70 years old, but I still love to play the organ. I play a recital34 every month and frequently play the organ for church services. I also play the organ or the piano for three Central College choirs35 as their accompanist36. I have played many organs in many places. Some of them were very large and some of them were very small. I am very happy that I had the opportunity to have a career37 in which I could play the organ so much. I still love it, perhaps now more than ever. 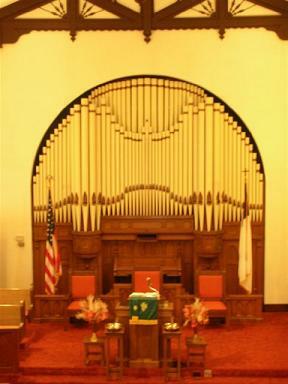 To the left is a photo of a modern organ that was built in Iowa by Dobson Pipe Organ Builders, Ltd. It is located in Grand Rapids, Michigan. You can see the large pipes at the front of the organ case38. You can see three keyboards and the pedal keys played by the organist’s feet at the lower right. 1. keyboard instrument (键盘乐器): a musical instrument with an arrangement assemblage of keys, usually black and white, which are struck or pushed by the finger tips to cause a musical sound to be produced. 2. pressurized air (压缩空气): the compressed air of a pipe organ, which is forced through the pipes to cause a musical sound when the key is struck or pressed down. 4. pitch: highness or lowness of sound (高低度，声调). 5. tone colors: the quality of tone produced by a voice or musical instrument (音色，音质). 6. pedals: oblong key or lever pressed by the foot in the playing of an organ or other musical instrument ( 乐器的踏板). 8. notes: sounds produced by the voice or musical instruments (音，乐音). 9. concert halls (音乐厅): areas built for the purpose of playing and hearing musical performances. 10. designs n. patterns developed to look attractive (图案). 12. “it all began”: an idiomatic expression telling when something started. 13. procession: a group of individuals moving along in an orderly, often ceremonial way (队列，行列). 16. sensation: a feeling (感觉). 17. developing: forming (strong skills or capabilities). 18. keyboard skills: talents or ability to perform well on a musical keyboard (键盘弹奏技能). 19. become discouraged: be made to feel hopeless about something (丧失信心). 21. would rather: prefer to choose or do (宁可，宁愿). 22. playing ball: playing baseball, the favorite American sport of most children in the U.S. ( 打垒球). 26. Central College: an undergraduate college located in Pella, Iowa. 28. starting a family: an idiomatic way of saying “to begin having children”. 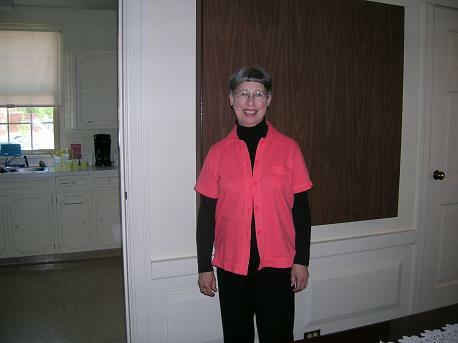 29. director of music: a person in charge of a musical program. 31. Jamestown College: a small liberal arts college in North Dakota. 34. recital n. a performance by one or a few individuals given as a public exhibition of skill. My answer to her was, “Good for me! But how do I happen to be ‘hip’ now after all these years of being old fashioned as far as you’re concerned? 14” She then showed me what she was reading on line15, which was a long article on how hip knitting has become16. Well, I could have told her that. All I have to do is look at the latest women’s magazines, my knitting magazines etc. to demonstrate that.17 It is an interesting and heartwarming trend18 as far as I’m concerned19 because I love to knit; in fact I love it so much that my friends and family have teased me about it over the years. Finally I am justified20! My mother and grandmothers were not knitters21. They did other handwork22 but not knitting. I really wanted to learn how, so when I was an undergraduate23 in college and made a friend who knew how to knit I prevailed24 on her to teach me, and then my love affair with knitting25 began. 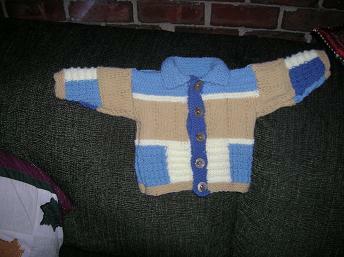 By the time I went to graduate school I was an avid26 knitter and could make complicated27 sweaters, socks etc. At that time I also met Don, who played on the university basketball team. As a busy graduate student28, I didn’t have much time for knitting, so I would take it with me when I went to basketball games to see him play. (Frankly29, I was much more a fan of knitting than of basketball, but if Don and I were to go out after the game I should have been there.) Well, I horrified30 and embarrassed31 his father and brothers by knitting during the game. Nonetheless32, they cheerfully33 accepted me into the family when Don proposed34 marriage. I became known throughout his family as “the knitter.” Don’s father always liked me because I would sit and knit while he recounted stories from his youth35, stories which I heard many times and which were knitted into the stitches36 of the things I created. For many years knitting was not popular, but that has certainly changed. After the 9-11 terrorist attacks37 on the U.S. it seems that people wanted to go back to some of the old, comforting ways, and that has included knitting. I agree that there is something comforting38 about the rhythmic repetition39 of knitting and the sense of accomplishment one has as the ball of yarn40 turns into a pretty and useful item. I read an article in a woman’s magazine this past week about knitting as a “stress buster41.” I could have told them that years ago.42 When I first started my career of college teaching, we used to have to go to monthly faculty meetings43. I didn’t enjoy them and often thought them a waste of time44, so I started taking my knitting. That surprised most of the other professors, but since no administrator45 ever said anything to me because of it, I continued it for my whole teaching career46 and felt that something positive finally came from faculty meetings. I hear that now other people knit at faculty meetings that I no longer have to attend. Good for them! I have rambled on47 long enough. After all, I could be knitting. I’m trying to finish a sweater for the daughter of our visiting Chinese professor from Zhejiang University. I want to give it to her for Christmas. Tomorrow I’ll also attend a group knitting session of knitters of all ages. We’re all hip. 1. hip: doing things or done according to the latest fashion (新潮的，时髦的). 2. referred to: thought of, or regarded as (提到，称之为). 3. strict: expecting people to obey rules or to do what you say (严格的). 4. certain hours: particular time (特定的时间). 5. teases: laugh at someone and make jokes in order to have fun by embarrassing them (取笑). 6. old fashioned: not modern, not up to date (老派，不时髦). 8. behavior: the way one acts in public; one’s conduct (行为，举止). 9. shocked: quite surprised or amazed (震惊，惊愕). 11. have missed: have failed to hear or understand (没听说，不理解). 12. as it did in 1904: as it meant in 1904 (正如这个字在1904年时的意思). 15. on line: connected to the Internet (联网地，在网上进行地). 18. heart warming trend: a cheerful or sympathetic change in direction (令人高兴、可喜的潮流). 19. as far as I’m concerned: as I think or believe about something (就我而言，以我之见). 20. justified: proven right; correct in the matter (证明是对的). 21. knitters: people who knit. 22. handwork: a product made by hand (手工活). 24. prevailed on her: convinced or persuaded her (说服她，劝说她). 25. my love affair with knitting: my strong enjoyment of knitting (我对编织的热爱). 30. horrified: made someone feel very shocked and upset or afraid (令人震惊). 31. embarrassed: caused someone to feel uncomfortable or ill at ease (令人尴尬). 33. cheerfully: happily, with merriment. 34. proposed marriage: asked a person for marriage (提出结婚). 35. recounted stories from his youth: told someone stories of earlier experiences (讲述年轻时的故事). 37. 9-11 terrorist attacks: the bombing of New York Trade Centers and Washington D.C. by an organized group of anti-American s on September 11, 2001 (911 恐怖袭击). 38. comforting: making one feel less worried, unhappy, or upset (令人宽慰的). 39. rhythmic repetition: process of doing something with a stylistic pattern of action (有节奏的重复动作). 40. ball of yarn: a round, tightly wound length of yarn that can be easily and conveniently used for knitting an item (毛线团). 41. “stress buster”: something that can relieve stress, or cause to relax (能消除紧张的东西). 43. monthly faculty meetings (每个月的教工会): members of a faculty or group of teachers discussing and acting upon academic and governance issues of a school, college or university. 45. administrator: a person in a position of leadership (行政官员). 47. ramble on: talk or write for a long time in a way that other people find boring (啰里啰嗦地讲、写).